ROYAL HIGHLAND SHOW - 20th to 23th June 2013. After many years of exhibiting at the Royal Highland Show, it was much delight for the McMillan family, Gib and Mary and son Allan, that the trading name of Messrs Wallace of Over Barskeoch, Dalry, Castle Douglas will appear on the handsome and famous Royal Highland show trophy. Their champion, Una of Over Barskeoch is a rising three old heifer from a home bred sire Greenloop Limited Edition and out of Dandy of Over Barskeoch. She was first in the largest class of the day of 7 entires and went on to secure the championship over the male champion, Klondyke Raider. 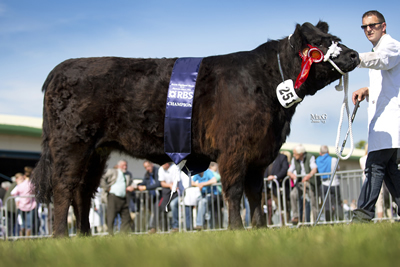 Raider an 2008 born bull was exhibited by family partnership J, M & D Maxwell , John, Margaret and Duncan Maxwell, from Blairvockie, Rowardennan, Drymen and was shown by Duncan’s son David. He was bred by Klondyke Farms Ltd, Moniaive, Thornhill and is by the German import Holsten Ed N54. Raider was purchased in a private deal in 2010. The female reserve champion was from Messrs J Finlay, Blackcraig, Corsock, Castle Douglas, their blue and white rosette winner was Blackcraig Noreen T433, this 2011 born heifer is a Finmac Norseman daughter and out of famous show cow Blackcraig Noreen L122, previous winner of the 2006 and 2011 Royal Highland Shows, her son Blackcraig Rasputin is senior stock bull at Blackcraig. Noreen T433 also collected the rosette for Galloway Junior champion. The Reserve male was also from the McMillan Family, Viper of Over Barskeoch an November 2011 born calf, his sire Barlaes Fearless was purchased at the 2008 Society Spring Sale and his dam Beatrice of Over Barskeoch , now a nine year old cow has produced many show winners. Once again the Society was represented in the Breed Stand Avenue, this year saw the launch of our new branding, which included, logo, flags, posters and leaflets, all the new items were very well received and members and friends are invited to use the new logo whenever possible. After the judging, a post show drinks reception which was sponsored by Allflex was enjoyed by all our exhibitors and friends, this ended a very enjoyable and pleasant day, what a difference when the sun shines. 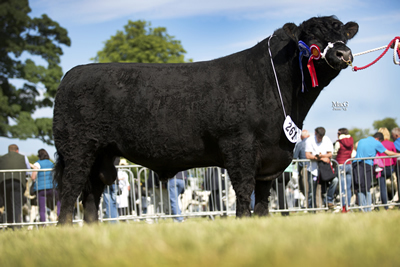 2013 RHS Galloway Reserve Champion – Klondyke Raider – exhibited by J, M & D Maxwell, Blairvockie, Drymen, Bred by Klondyke Farms Ltd, Moniaive, Thornhill.